In an increased effort to promote safe sleep education, the Wayne County Department of Public Health (Michigan) will utilize a Safe Sleep mini-grant from the Michigan Department of Community Health to facilitate safe sleep workshops for new mothers and parents. The grant will enable a safe sleep educator to be hired and teach safe sleep classes to Wayne County participants who will then take a "Safe Sleep Pledge." This year, unsafe sleeping arrangements continue to be the leading cause of accidental death for infants under a year old in Wayne County, according to the Wayne County Medical Examiner’s Office and the Wayne County Department of Public Health. Asphyxia, commonly known as suffocation due to unsafe sleeping environments, was also the number one cause of accidental death for Wayne County babies in 2012. "The tragic death of an infant due to unsafe sleep practices is something that happens far too often, and every baby that fails to celebrate its first birthday is one too many," said Wayne County Executive Robert Ficano. "Every year, our public health department continues to work diligently to raise safe sleep awareness in the community and collaborate with other health departments and organizations to stop this disturbing occurrence." The city of Detroit continues to experience a disproportionate number of infant deaths in 2013, with 20 babies dying so far this year from unsafe sleeping environments. During the same timeframe, Wayne County’s 42 communities outside Detroit experienced 5 infant deaths due to suffocation from unsafe sleep. The prior year, in 2012, unsafe sleep practices claimed the lives of 34 Wayne County infants—24 from Detroit and 10 from other Wayne County communities. Infant mortality rates from the Michigan Department of Community Health (2010 - most current available) show 13.5 deaths out of 1,000 births in Detroit, and 9.7 deaths per 1,000 in the 42 Wayne County communities outside Detroit. These statistics compare to an average of 7.1 deaths in Michigan out of 1,000 births statewide. But the problem of infant mortality due to unsafe sleep, knows no boundaries. During the three-year period from 2010-2012, 424 Michigan babies died -- or 17% of the state’s infant deaths-- from unsafe sleep environments. 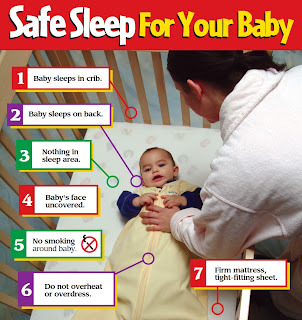 ensure that their babies are sleeping safely so these infants can awake safely to begin another day." Infants sleeping on their stomachs face down or wedged against soft objects which can interfere with breathing. "Wayne County’s immediate focus and key objective is to provide ongoing community education and raise awareness to reduce and prevent the tragic aftermath of unsafe sleep," said Dr. Hammami. "We also encourage individuals, organizations, schools and communities to become ‘Safe Sleep Ambassadors’ and join in future collaborative safe sleep outreach efforts."